I know a lot of women complain about their body fat, and especially about the fat from certain spots of their body, like: under chin fat (double chin), belly fat or armpit fat. Today we’re gonna concentrate on how to get rid of armpit fat. You can not spot reduce fat! So in order to get rid of armpit fat or fat from any parts of the body we have to reduce our body fat overall through exercising and also eating a well balanced diet. A full body workout consists in both cardio and strength training. This can help to reduce body fat and also to get rid of armpit fat. This workout will aim to tone the ‘armpit fat’ area through chest exercises which also include shoulders and arm muscles. It’s pretty intense, so using a heating pad for sore muscles can sooth your after-workout aches and pains and make you feel ready for the next day workout. So all you’ll need is a pair of moderate weight dumbbells. Just make sure you choose the correct weight for your dumbbells. You can do these exercises on a mat, on a bench or on a Swiss ball which will make it more challenging. Let’s get started! Lie on your back, grab your dumbbells and lift them up to the ceiling. Make sure they are in line with your chest. Keep your knees up and your feet flat on the floor. Bring the dumbbells towards your chest, slow and steady. When you touch the floor with your elbows return slowly to the starting position. Push ups is one of the best upper body workout and it really tones the entire ‘armpit fat’ area. Instead of the normal push up, for staggered push up you need to place one arm at the chest level and one arm about 3 inches forward. This will challenge your arms even more. Do 8 reps on each side. 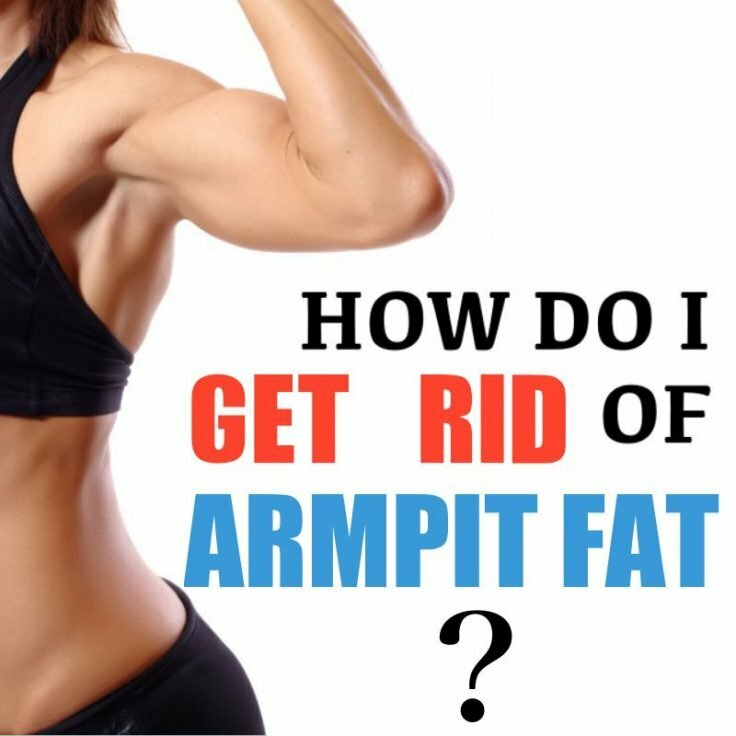 You have to do flies to get rid of armpit fat! It’s a must do. These exercises really work on the exact area we want and definitely will tone it up. As you get stronger you’ll want to increase the weight so we recommend using adjustable dumbbells. Start from the same position as in the first exercise (chest press). Palms facing in, open it slowly until the upper arm touches the floor then squeeze it up. Control your moves slowly to incorporate every single chest and arm muscle. Take a one minute rest between sets and repeat this workout to get rid of armpit fat 2 or 3 times. Do this 2-3 times weekly combined with your total body cardio and strength training. With consistency you will be able to wear sleeveless tops in no time. These exercises are not recommended if you’re suffering from armpit pain. If you do, check out this article for more information and consult your doctor. I hope you enjoyed this article and if you did so, please share this post with your friends. Stay fit! Thank you. This is very useful information. Have to get cracking on my armpit fat. When it says do 10 reps once you have finished all the exercises that’s one set! What counts as a set? Doing all 3 exercises for 1 set? One of your goals is to stay healthy and fit, so grab your mat and get ready for a fat-blasting set of 10 full body workouts. Doing these exercises to strengthen the core and hips along with maintaining a healthy weight can help you to prevent hernia from occurring. With a focus on shoulders, abs, and the booty, all the exercises in this bikini body workout are designed to help build a better bikini figure. This list with the most fun, effective and enjoyable exercises can help you burn 300 calories in 30 minutes or less. Burn 100 calories doing these fun workouts and lose up to 10 pounds in 30 days. They're easy cardio exercises that can be done by anyone. The best way to eliminate the unwanted cellulite is through proper workout. So we've gathered for you the best home exercises to get rid of cellulite. Your busy schedule doesn't have to be an excuse to exercise. You can even get a good exercise in your car on your way to work. These full body Pilates moves engage your core and leg muscles, and improve your balance, coordination, and strength. Here are 7 workout alternatives to your best cardio for weight loss, that are time efficient, burn fat like a furnace, and are fun too.